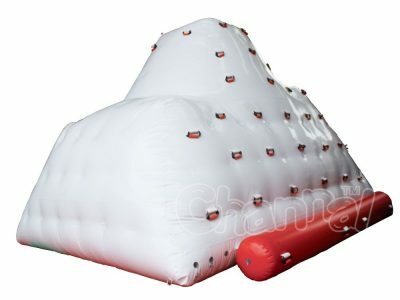 Inflatable iceberg is a blow up rock climbing wall for water, it is designed as an iceberg with holds, so its color is often white. 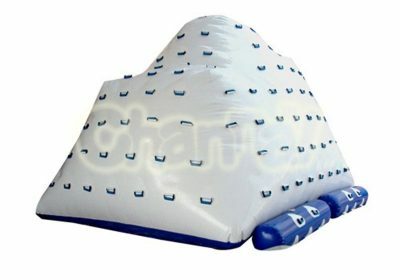 Inflatable climbing iceberg can be used for lake, river, ocean, pool, and is best to be a part of a inflatable floating water park. Climb is not the only fun, some water icebergs allow you to slide down into water, and you can always jump from top. Definitely a great floating climbing wall toy for summer water fun, enjoy the fun with your family and friends. Channal Inflatables is a professional inflatable iceberg water toy manufacturer in China. Contact us to customize your own giant icebergs at cheap prices.